I just recieved my Fujifilm FinePix E900. I bought it to use as a carry around and was looking for a few things. RAW, low noise and a reasonable high resolution. I will post a review after a few more shots and a print or two. 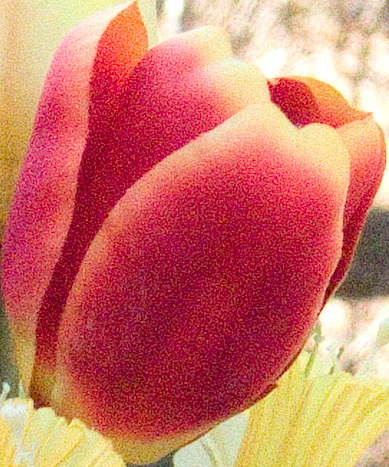 Attached is a 100% crop of a shot at ISO 80 and ISO 800. So far I like it. A lot. Thanks for posting this. It's always nice to get first impressions about new cameras. I hope you don't mind that I moved your post to the digital cameras forum. I thought it was a better fit and would help more people here. Plus, there's still a link to the thread on ViewFinder. No prob on the relocation. I couldn't decide where best to post it. I will post a review in the reviews section when I get a few more clicks with it under my belt. You know, I really like the second image. Digital photographers have gotten so uptight about noise. But it can be nice, when used artistically. This image reminds me of some stuff I shot a long time ago. I worked in an E6 (slide film) lab in the early 90s and played a lot with pushing and pulling slide film. One of my favorite things to do was shoot Agfachrome 1000 and push it two stops. It would get really, really chunky and the colors would be very pastel-like. It had a soft, dreamy, almost pointilist feel. Unfortunately, I lost those slides. Anyway, noise/grain isn't all bad. And your second photo looks nice with some noise. Ah, the forgotten FujiFilm E900... I just scored a "like new" E900 & I must admit... it's fun in a nostalgic sort of way. I'll be posting my first impressions on this antique vintage "gem" soon. I really liked the 2nd pic, sharpness is excellent throughout the range, but image is consistently soft and beautiful. And noise is noticeable in the image esp in high contrast color transition but used creatively. Keep up the great work. I have read somewhere that E900 comes with a pathetic 16MB memory card, is it correct but other features are good enough like saving images to the memory card is also much faster than other cameras and Start up time is very fast including booting up the camera software.Except one point other features are very impressive.